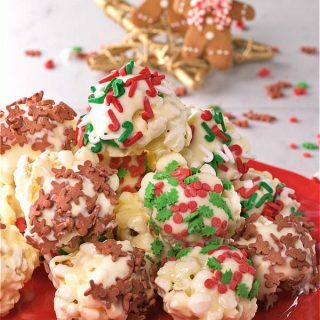 Holiday White Chocolate Mini Popcorn Balls (Cookie Exchange) | Homemade & Yummy Homemade & Yummy | Fun delicious recipes and more. 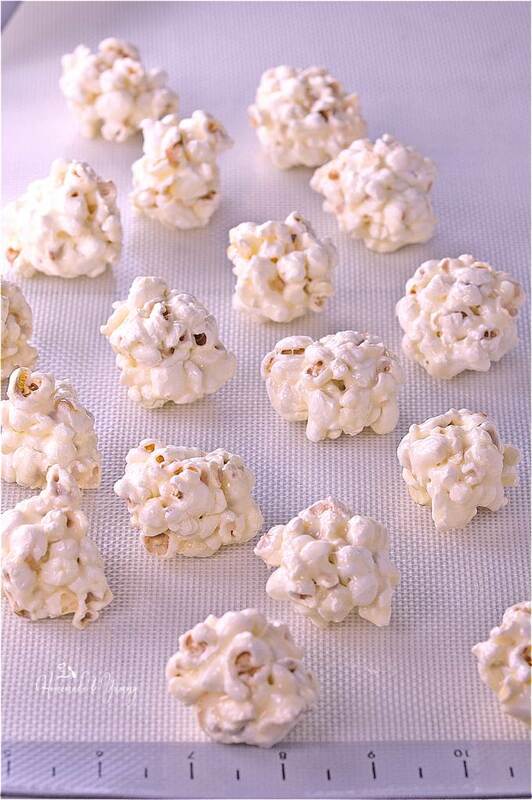 Holiday White Chocolate Mini Popcorn Balls are the perfect addition to any cookie tray. 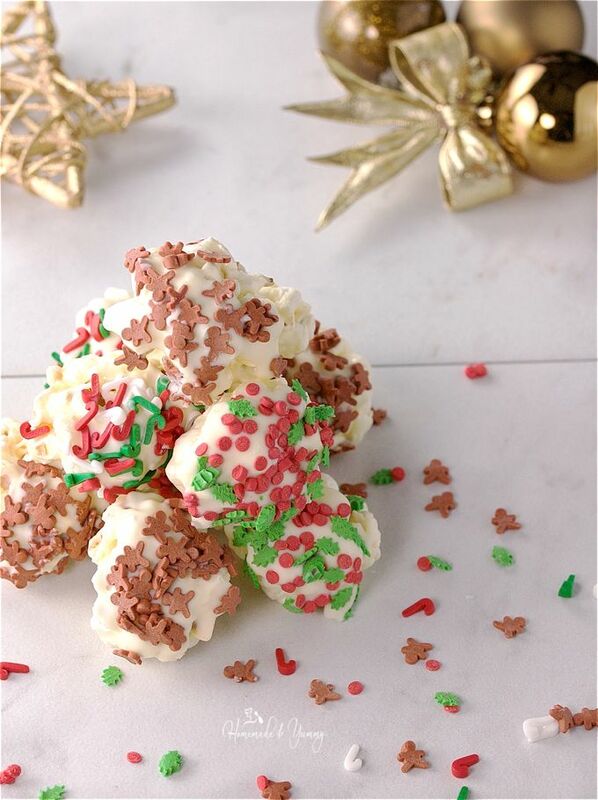 Bite-size balls of popcorn dipped in white chocolate and decorated with holiday sprinkles. An easy no bake, gluten-free treat that makes an awesome food gift too. Here it is, December. The busiest month of the year. How is your “to do” list coming along? Is the tree trimmed, stockings hung, shopping at least started? 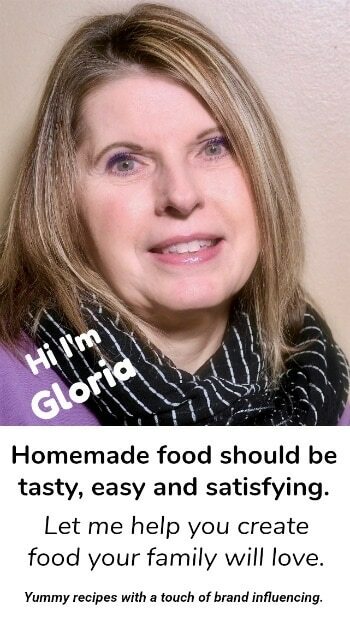 What about baking? I am making my grocery list as we speak. All those holiday treats are just around the corner. December is such a whirlwind month. It just doesn’t stop from now till January. Parties, shopping, baking. Running all over town just trying to gather all your goodies for the big day. 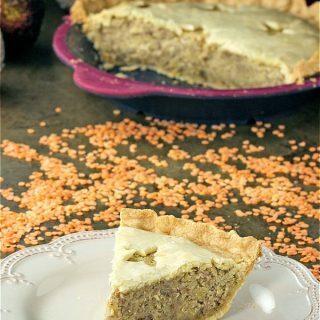 We all need quick and easy recipes to help us out this time of year. These easy popcorn balls are just that. 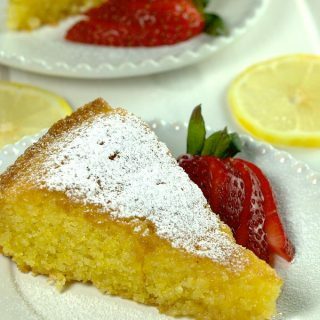 In fact, this is a great treat for the kids to help you with. Are you a baker? 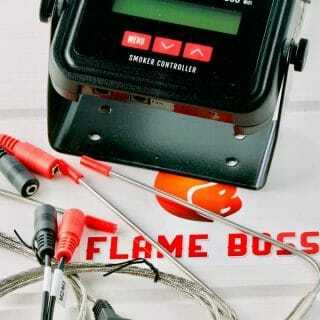 Have you started? 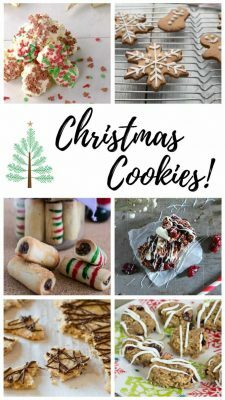 The wonderful bloggers of #FoodBlogGenius have put together a great collaboration of Christmas Cookies. 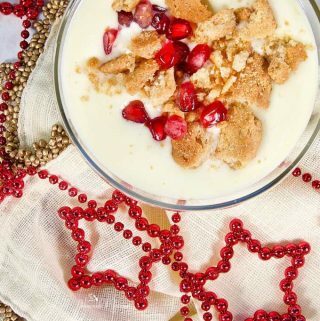 If you haven’t started thinking about what you might like to make, I’m sure you will want to try a few (if not all) of these tasty holiday creations. Now that December is officially here, it’s time to get things (like so many things) in order. From now till Christmas, time will fly by, and before we know it Santa will be making his way around the world. We put so much time and effort into this very special day of the year. When it’s all over, I am usually relieved, sad and totally exhausted. No matter how much you can get done ahead of time, it seems there are never enough hours in the day during the month of December. Everyone has their favourite holiday foods. 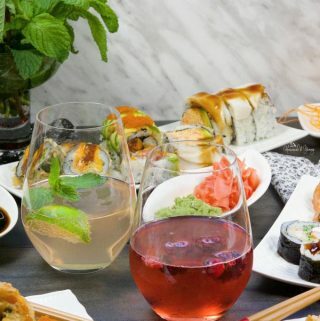 Cookies, treats, drinks, so many totally delicious things to indulge in during the season. What are some of yours? We can’t go without eggnog. Rum & Eggnog Latte happens to be our favourite festive drink. I know these popcorn balls for Christmas are certainly on my grandkids list of things for gramma to make. I mean who doesn’t love popcorn covered in white chocolate and melted marsmall0ws? No other time of year do I enjoy white chocolate more than during the holidays. 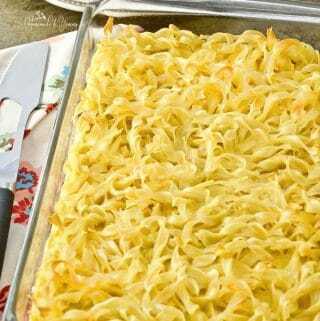 It just seems to pair so well in many recipes. I love it in my Oatmeal Cranberry Cookies with White Chocolate & Pistachios. Quick & Easy Festive Holiday Croissants would not be the same without that white chocolate drizzle. 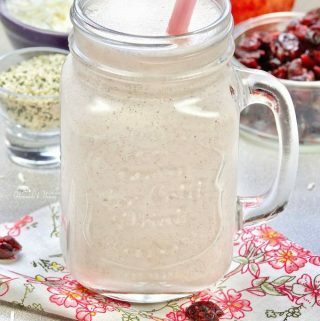 Are you a white chocolate lover too? Holiday baking really is something I have been used to all my life. My mom would always make such wonderful cookies every year. My kids always ask for their favourites, and it just wouldn’t be Christmas without shortbread, candy cane cookies, peanut butter bars, and rum balls. Do you bake? It seems like it is a love or hate topic. 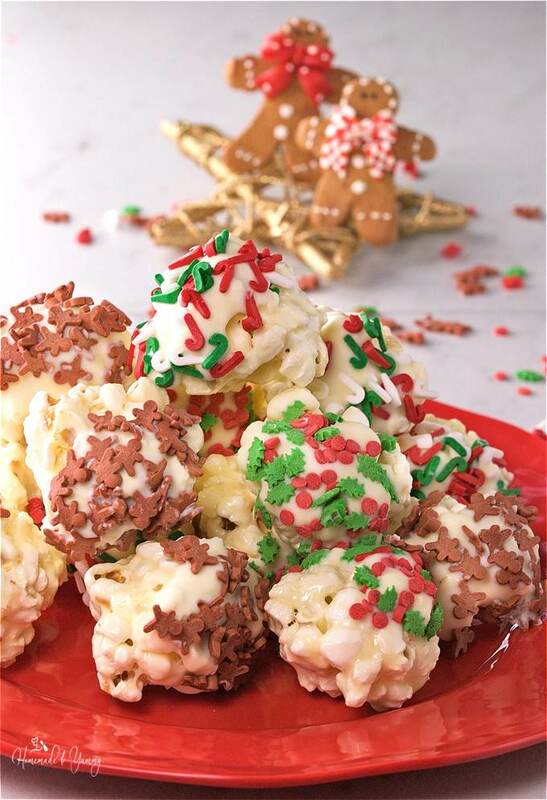 How about some “no bake” treats like these Holiday White Chocolate Mini Popcorn Balls. These popcorn balls are so easy to make, and look so cute on the cookie tray. 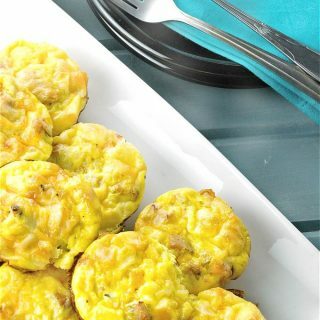 You could even make them as a “food gift” to take to your next party or potluck. 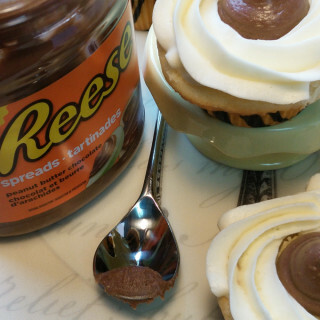 Perfect for cookie exchanges too. All you have to do is make some popcorn (or buy some ready popped). Melt some mini marshmallows with butter, mix with the popcorn and form into balls. 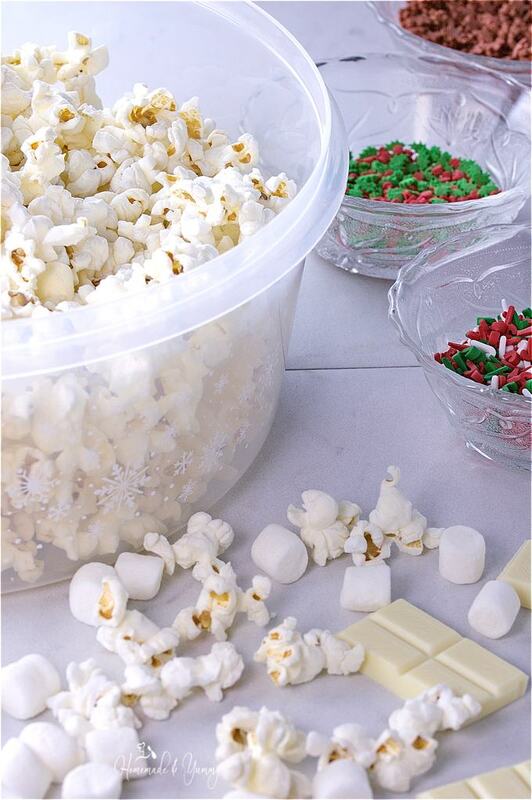 Melt some white chocolate, dip the popcorn balls, then decorate with any holiday sprinkles you desire. Gingerbread people, snowflakes, coloured balls, even crushed candy canes would be awesome too. If you are not a baker, but still want to make holiday treats these Holiday White Chocolate Mini Popcorn Balls are for you. Tis the season to indulge, so don’t forget to stop by and visit the other wonderful bloggers of #FoodBlogGenius and check out their mouthwatering holiday treats. 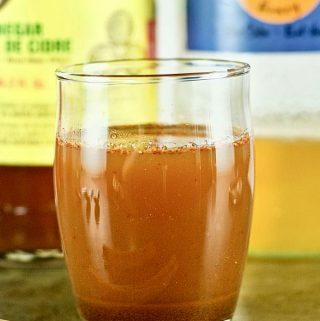 Pair those holiday treats with a great holiday drink. Festive Holiday Special Tea is perfect. 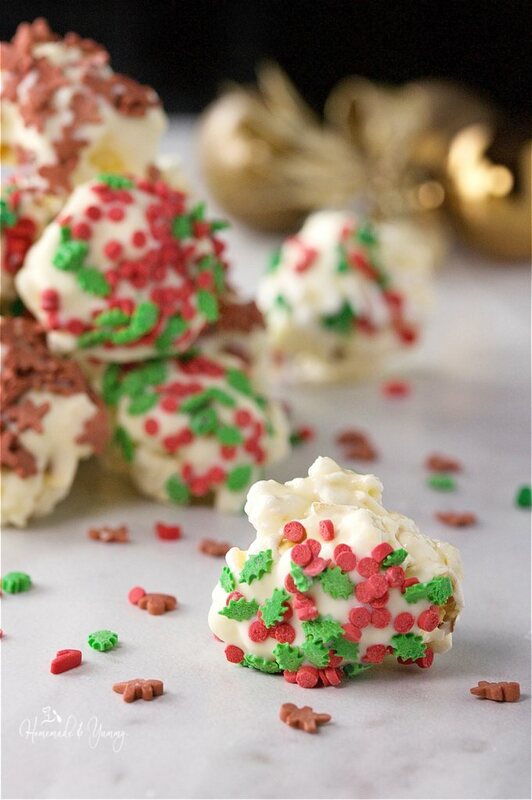 Holiday White Chocolate Mini Popcorn Balls are the perfect addition to any cookie tray. Bite size balls of popcorn, dipped in white chocolate, and decorated with holiday sprinkles. An easy no bake, gluten free treat that makes an awesome food gift too. Lay out a silicone mat on the counter. In a pot melt the butter and marshmallows. Pour over popcorn, and mix well. Squeeze popcorn into 1 1/2" balls and place on silicone mat. Place your sprinkles in bowls. Melt the white chocolate (either on the stove or microwave). Dip each popcorn ball into the melted chocolate enough to cover the top half of the ball. Immediately dip the popcorn ball into the sprinkles. Place on silicone mat to harden. Right now I’m collecting recipes for my Christmas gift boxes and these Holiday White Chocolate Mini Popcorn Balls are adorable. Now, who doesn’t like popcorn? 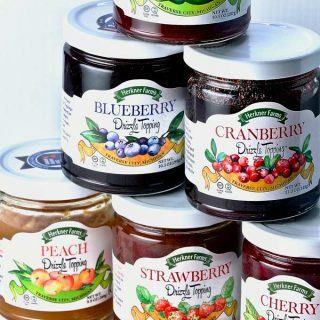 And add all those delicious goodies to it, it will be a welcome addition to the gift box. These are a fun addition to any party treat try. You can even get the grandkids to help you make them. Thanks so much. They are a fun and festive little treat. Oh that looks good! So colorful, fun and festive! They are fun to make and fun to eat. These cookies are so pretty. I love popcorn with the white chocolate. 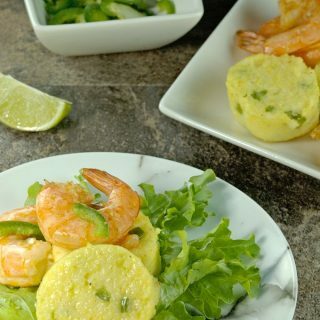 They are super easy to make…and delicious too.